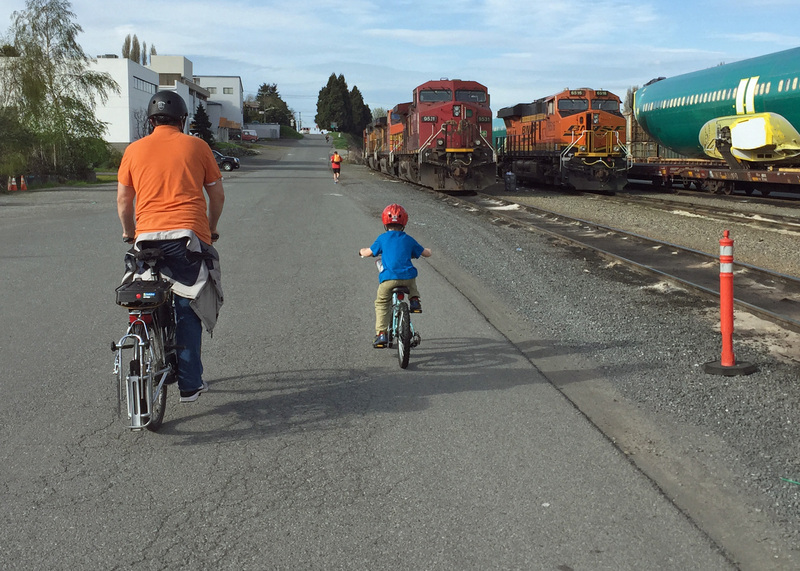 One of the best parts about being a family that gets around by bike is the sense of community. 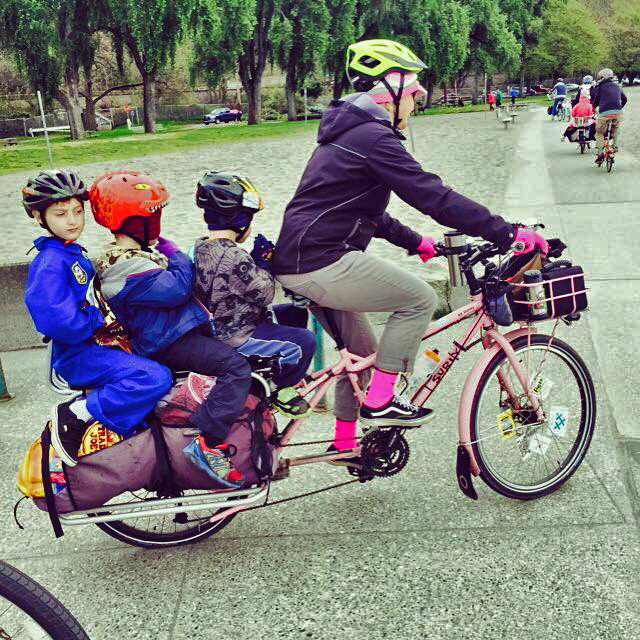 Here in Portland you can get connected through Kidical Mass PDX or the PDX Cargo Bike Gang on Facebook. 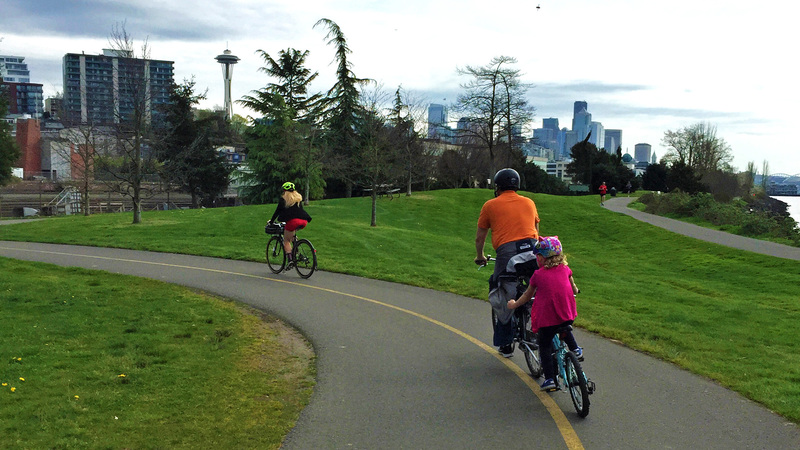 These communities are an excellent source of advice about family biking fun and family biking how to. 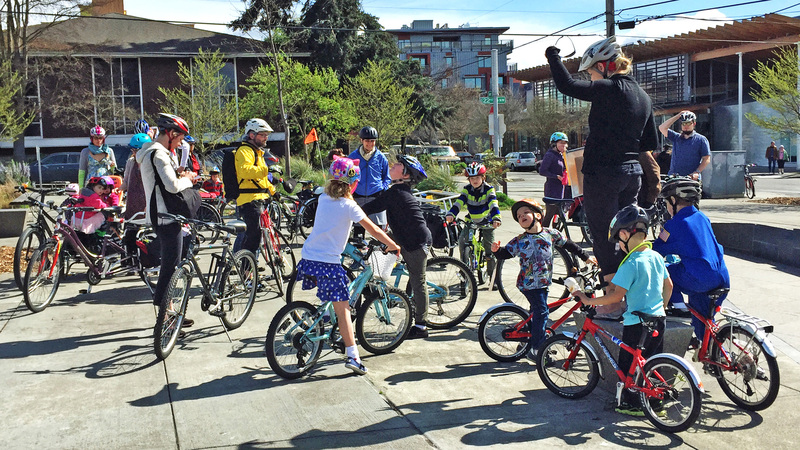 Trust me, your joy in experiencing childhood through the lens of a parent is not complete until you’ve experienced a Kidical Mass ride. It is a parade of cuteness, comradery, empowerment, and fun. It was through a PDX Cargo Bike Gang dinner meet up that I met Madi, from FamilyRide.com, and started following her blog. 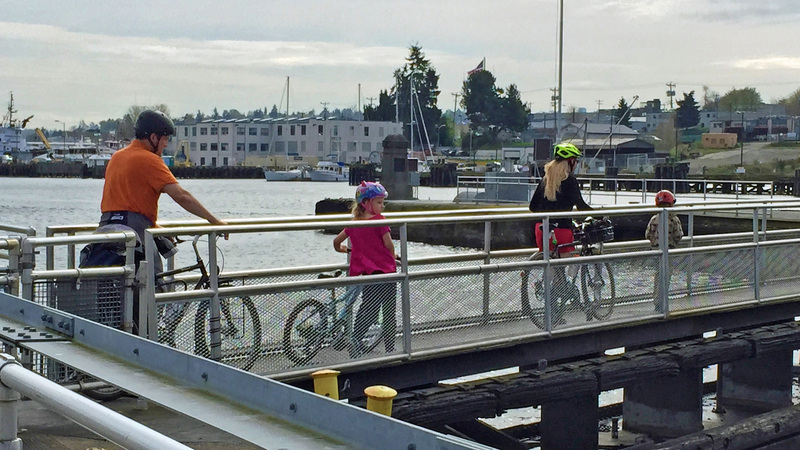 Seattle biking comes to life on her blog, and I was inspired to bring the family and check it out. After purchasing our tickets I decided to message her and ask if she had any advice about neighborhoods, routes, or destinations. Madi is an amazing ambassador for Seattle family biking, not only did she give me some helpful pointers, she hooked me up with the Seattle Family Biking group on Facebook, offered to go on a few rides with us, and organized a Seattle Kidical Mass ride during our trip so we could meet even more Seattle biking families. My kids felt super special (I felt pretty special too). 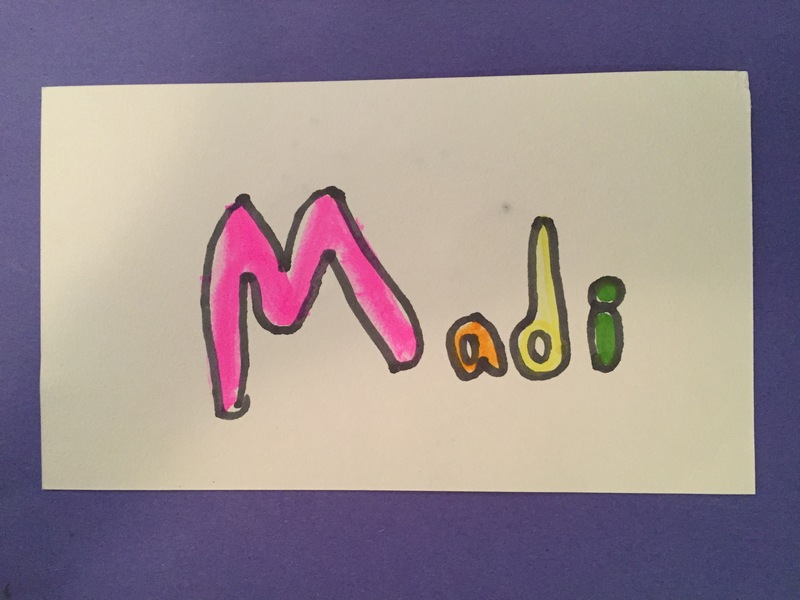 My daughter drew this little card for Madi when she learned about the Kidical Mass ride. 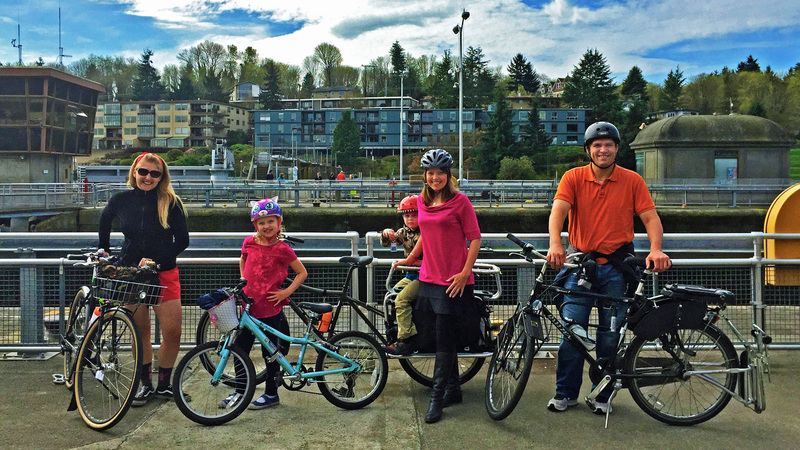 Between Madi and the Seattle Family Biking group we had all the information we needed to plan a fabulous family biking adventure. 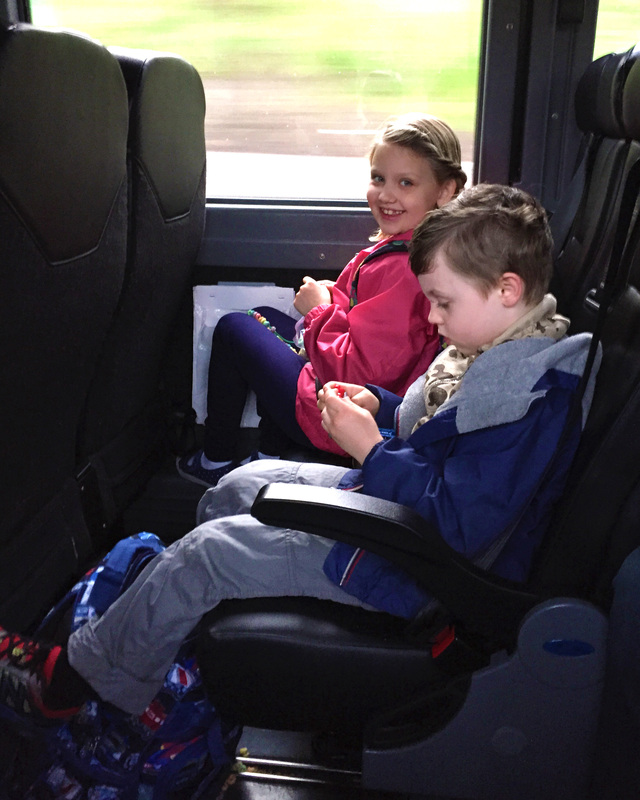 We started our adventure on the Bolt Bus. 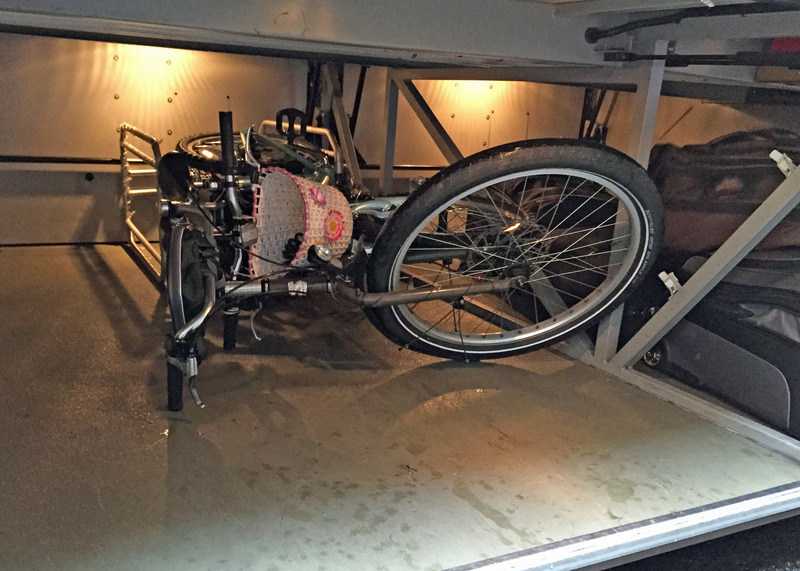 The Bolt Bus is one of the few forms of mass transportation I know of that will allow you to transport a fully assembled cargo bike, thus making it the ideal mode for our trip. While I had seen pictures of Madi’s bike on the Bolt Bus, I was a little nervous about this going off without a hitch. I actually called Bolt Bus twice to confirm the policy. I called once before booking our tickets. I was told that loading the cargo bike into the cargo bay, unboxed, would not be a problem. The second time I called about another issue, but inquired about the cargo bike again, just to be on the safe side, that time I was told it had to be put in a bike box. As is my style, I decided to go with the answer I wanted to hear, but be prepared with a back-up plan. I am pretty comfortable with a degree of uncertainty and openness to adventure. Upon stepping off the bus the driver immediately spotted my enormous bike and approached us. “What do you think you are going to do with that?” he asked in a challenging tone. “I was told it would fit in the bay below,” I offered in as pleasant a tone as I could muster. He was still giving me the skeptical raised eyebrow. Having recently spent 6 months evaluating a workplace violence prevention program which focused on de-escalation I reflected quickly on those tools. What applies here…think, quickly think…ah ha, a common motivation to resolve our difference—getting on the road on time. “I could disassemble the bike a bit—it would take about 15 minutes,” I offered helpfully. We both knew he only had 15 minutes to get on the road. “Oh, just try fitting it in here,” he offered, opening up an empty bay. “Yes!” my inner voice celebrated, doing an imaginary happy dance. It fit with room to spare. We were even able to stack my daughter’s bike on top of mine before sliding it in. I had contemplated taking the Utubes and Hoopties off, but I just ran out of time that morning. They actually made it much easier to slide the bike into and out of the bay. We arrived at noon and we were hungry! I had a very dear friend from graduate school who grew up in Russia. She introduced me to Piroshky on our first trip to Seattle together. If you’ve never had piroshkies they are a treat, hand pies, each one handmade to look a bit different and filled with either savory or sweet ingredients. Since she moved across the country I miss her a lot. 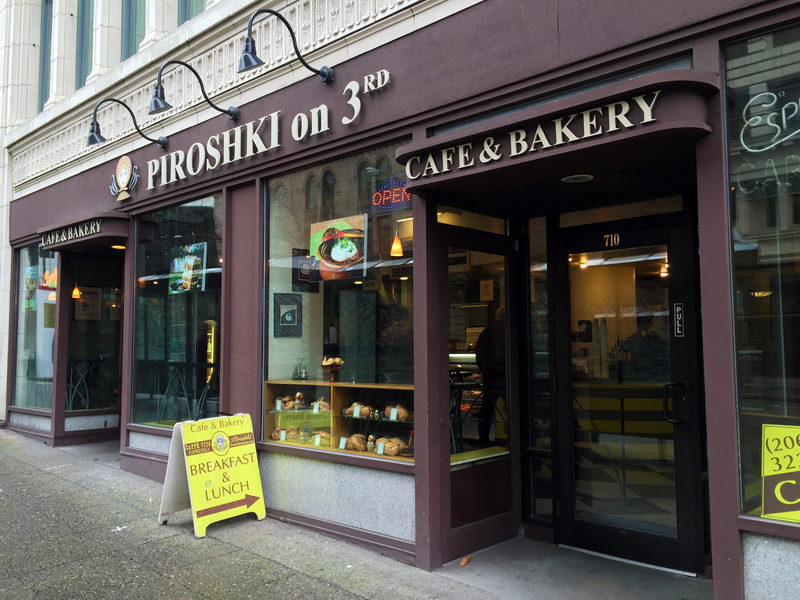 By way of tribute, every time I visit Seattle I stop in at Piroshki. Many may know of their location at Pikes Place, but they also have a store on 3rd where you can sit down. 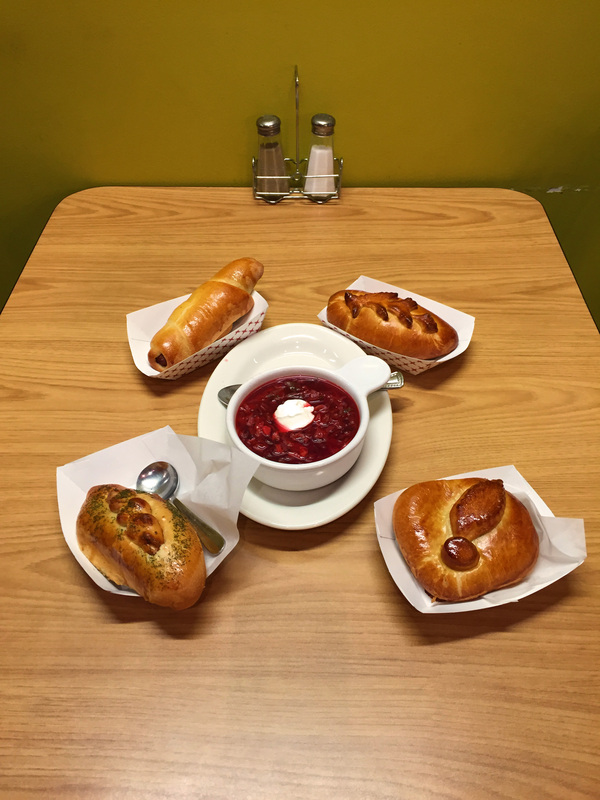 They also have delicious Borscht, a Russian soup made of beets and other veggies. This seemed like the perfect lunch stop for us, the service is fast, the piroshkies are already made and hand pies are naturally a child friendly food. After lunch we make our way through downtown Seattle. My daughter rode very confidently, on her own bike, through the busy downtown streets— this is after all her typical habitat. She was quite proud of her family bicycle advocacy when she overheard a woman on the sidewalk comment, “they really need to make a bike lane on this street so kids can ride safely.” She told this story to almost everyone we met. 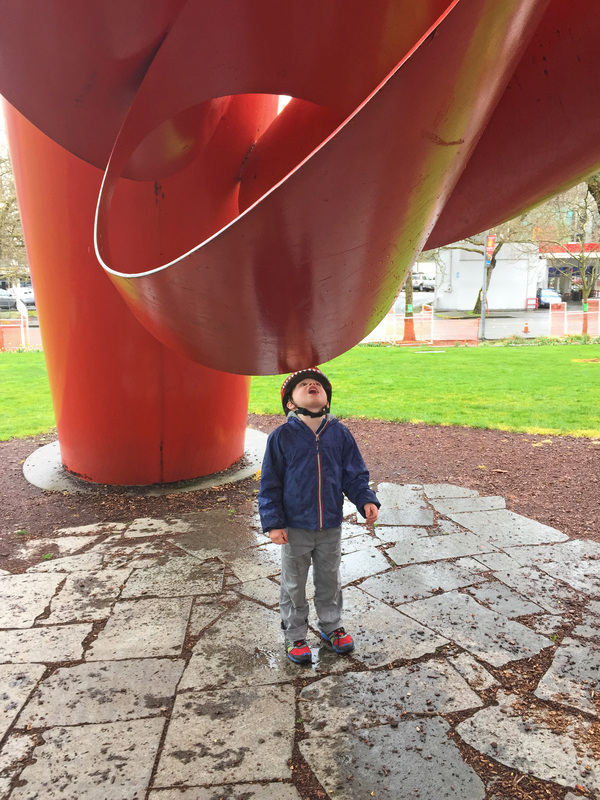 Even though it was raining, the kids enjoyed running around and exploring outside at the Seattle Center before heading into the Pacific Science Center. 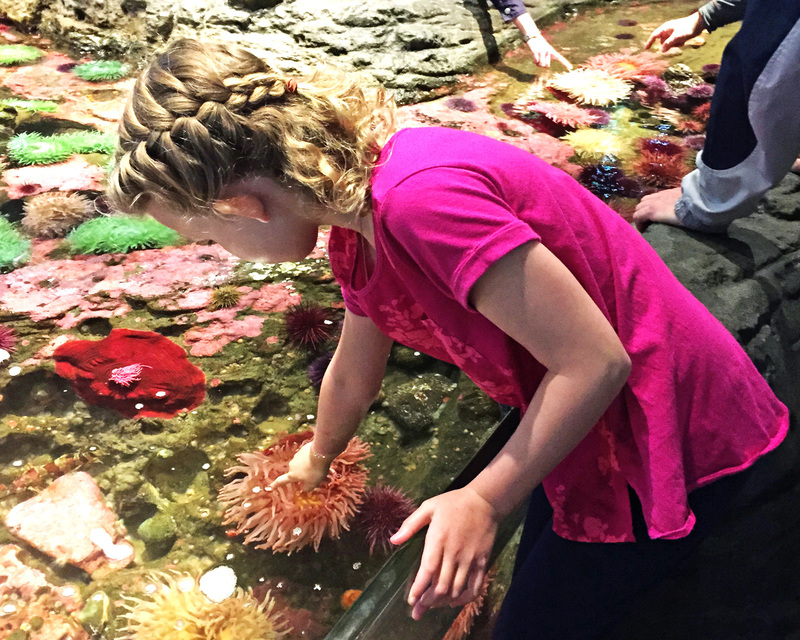 There were many interesting things to explore in the Pacific Science Center, some of their favorites were the actives to experiment with levers and fulcrums, the butterfly arboretum, and a station of brain puzzles that we had to practically drag them way from. 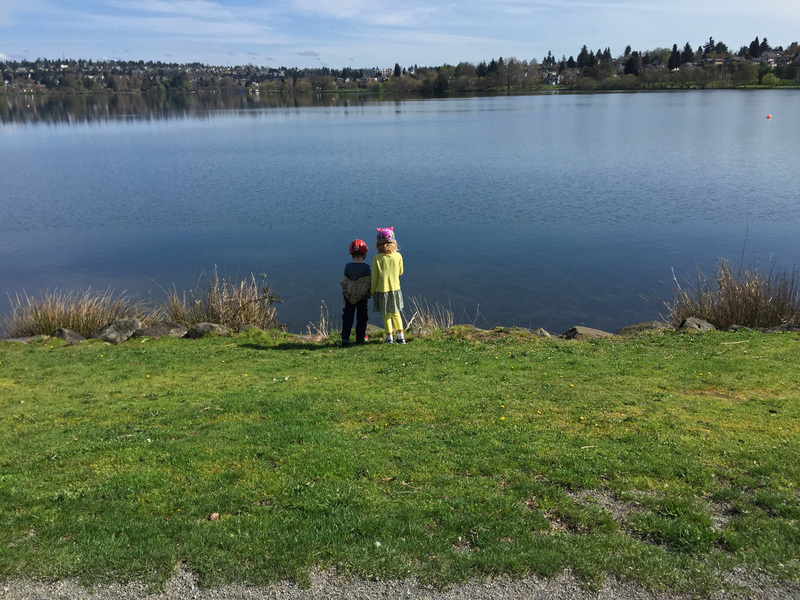 After closing down the Pacific Science Center, we decided to head to our rental near NW 28th Ave & 83rd St via the Cheshiahud Lake Union Loop. This route was a bit unexpected to me as it seemed like we were riding through a long parking that continue for almost a mile. Not sure if we missed the trail, but we were watching the other bikers and they all seemed to be riding through the parking lot too. I spent most of this section mulling over the logic of routing bikes through a parking lot—sure it was low traffic, but so many opportunities for a car to back out inexpertly into a bike—still perplexed by what that is all about? 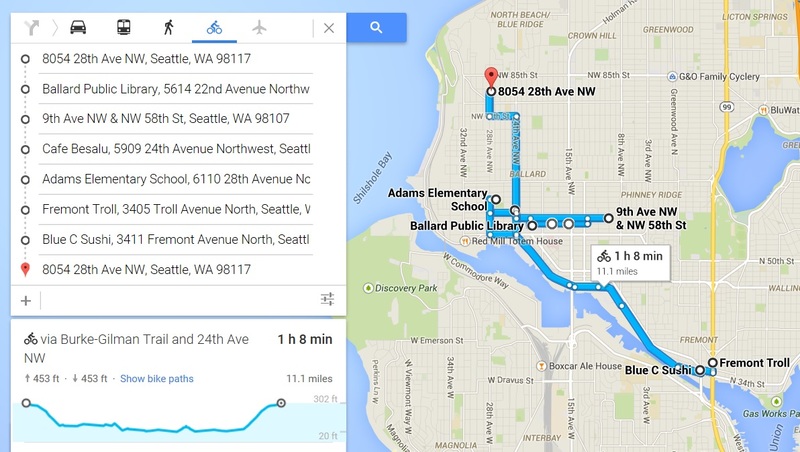 We crossed the Fremont Bridge and then got on to the Burke Gilman Trail. 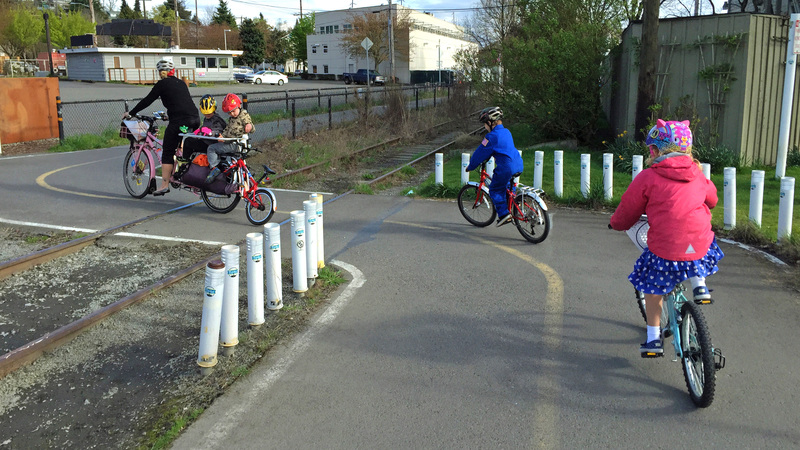 Love these paved multi-use trails, they make getting around with kids so much more carefree. The last leg of our trip involved climbing up 24th, a 5-6% grade for about a mile. 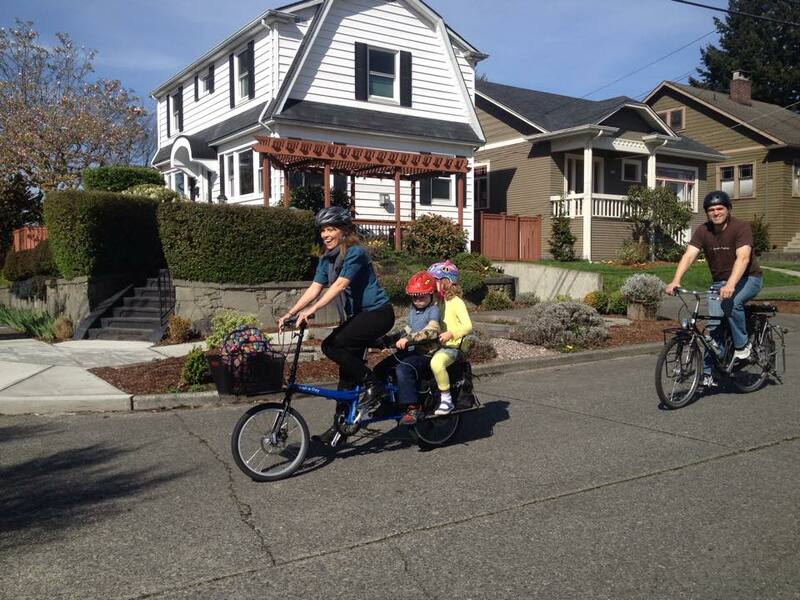 Our daughter hooked up to my husband’s bike using the Follow Me Tandem. Phew, pulling our little people up that hill was a workout! After that long ride we opted for something close to our rental for dinner, we chose Cafe Munir. This was my favorite food destinations—I love Lebanese food. I ordered three veggie dishes to share (fire roaster cauliflower, green beans, and asparagus)—I had a feeling the rest of our trip would be severely lacking in that food group. All the veggies came over a tahini and garlic sauce that was mouth wateringly delicious. My husband ordered lamb kabobs which he said were quite good as well. 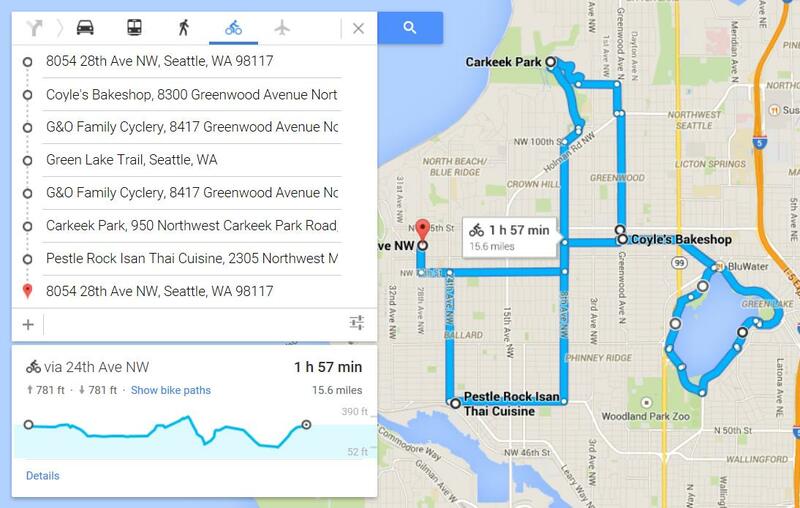 Besides exploring Seattle by bike, the other objective of this trip was to test ride the Haul-a-Day. Sadly, Portland does not have a Bike Friday Dealer. I discovered that G&O Family Cyclery carried the Haul-a-Day and offered test rides. 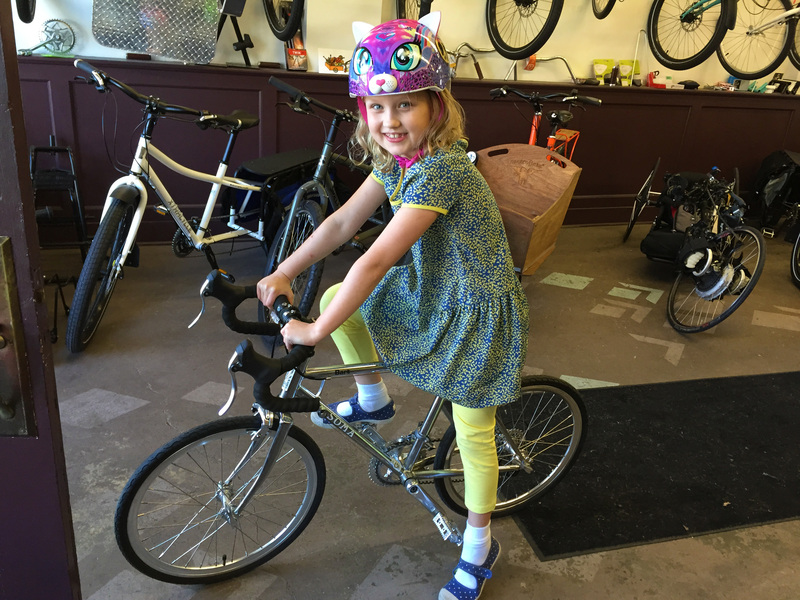 As it turned out Madi was picking up a bike from G&O Family Cyclery so we decided to meet up there. My daughter’s one request for our vacation was that we eat pastries. When I mentioned this to the Seattle Family Biking group it unleashed a flood of suggestions, apparently Seattle is brimming with delicious pastry destinations. One of the recommendations, Coyles Bake Shop, was right by G&O Family Cyclery so we made a morning of it. Madi met us there, my kids were bubbling with excited to meet her for the first time. I wasn’t going to indulge in any pastries myself…well maybe just a nibble of whatever my husband and kids chose. But, they were not sharing for nothing. My husband assured me that it would be worth the indulgence and ordered me three different pastries. The sour cream scone with dates was what I went for first, flakey on the outside, soft on the inside, a noticeable sour cream flavor, and just the right amount of sweetness, yum! I wouldn’t have chosen the mango passion fruit tart but since it was in front of me… It was surprisingly wonderful, an intense flavor, equal measure tartness and fruity sweetness. I don’t even recall the third, I am pretty sure it was consumed before I could get to it. 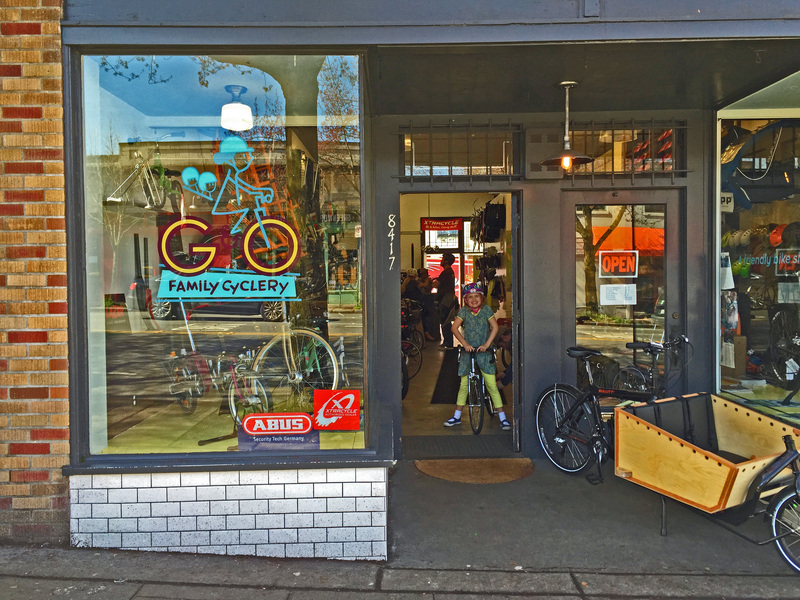 I was excited the checkout G&O Family Cyclery, a small bike shop selling family bikes that is a hub of the family bike scene in Seattle. We got to meet Tyler Gillies, one of the owners, who was very welcoming. He saw my daughter admiring a silver child’s Soma Bart with drop handle bars and pulled it out of the window and encouraged her to take it for a test ride. I envy the child who gets to take that beauty home! Donald was one of most approachable and helpful mechanics I have interacted with. And that’s saying a lot because we have some pretty wonderful bike mechanics back in Portland too. He took the time to explain the numerous ways the Hual-a-Day could be adjusted to fit both myself and my husband. He talked to us about how the bike could be customized. My rear brake on the Big Dummy was almost useless and he fit us in for a repair while we were doing a test ride. If a Haul-a-Day is in my future, I will defiantly look into the possibility of ordering here, I ❤ G&O Family Cyclery! Did I describe G&O Family Cyclery as the hub of the family bike scene, well it must be so because, not only did we met Madi there, I also ran into Brad Hawkins, who I grew up with in a small town in Eastern Oregon. He is now a cyclist and a musician who bikes around town with his cello. After catching up a little, I noted to myself that, in retrospect it makes sense that anyone self-assured enough to brave the stigma of playing the French horn in marching band as a kid is bound to develop into a really engaging and interesting person in adulthood. It was such a happy surprise to bump into him in a bike store of all places. It is light enough that I could lift it on and off the bus or train racks without a struggle. I have read several reviews of the Haul-a-Day. More than one commented that they are less stable than a more traditional diamond type frame, and that the smaller wheels can make the steering a bit squirrely. These reviews concerned me but, I wanted to experience it myself, and decide if these issues were mild enough to be overshadowed by the benefits mentioned above. 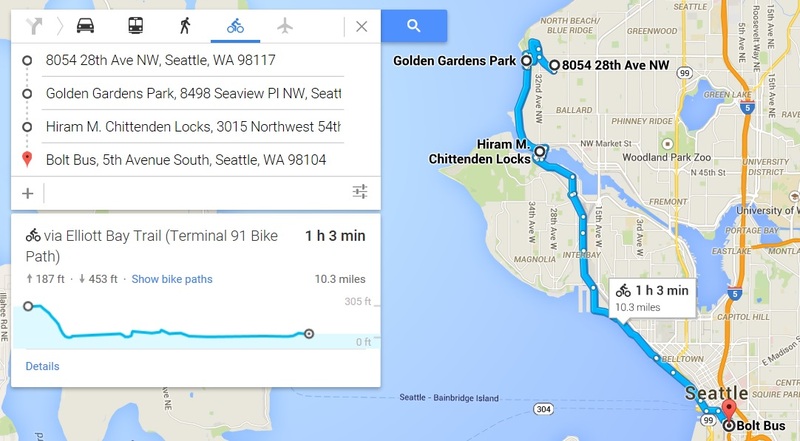 At my suggestion, Madi lead us on a test ride to Green Lake, which has a multi-use path around the shore of the lake. It was a lovely sunny day. We came across a vendor giving out free samples of frozen treats and stopped to enjoy them on the lake shore. Then we continued on around letting the children stop and play at the playground for a few minutes. If the Haul-a-Day was less stable or squirrely, I couldn’t tell. To the contrary, the lower deck made it feel more stable to me. It had a front mounted basket that was a little hard for me to get used to. The basket was large (deep, not wide) and covered my view of the front wheel. For some reason not being able to see my wheel respond when I turned the handle bars threw me off when getting started. Still, having the basket mounted to the frame meant that I could put my heavy backpack in the basket without impacting the steering, yay! Once I was moving I got the swing of it. The final verdict, I loved it! 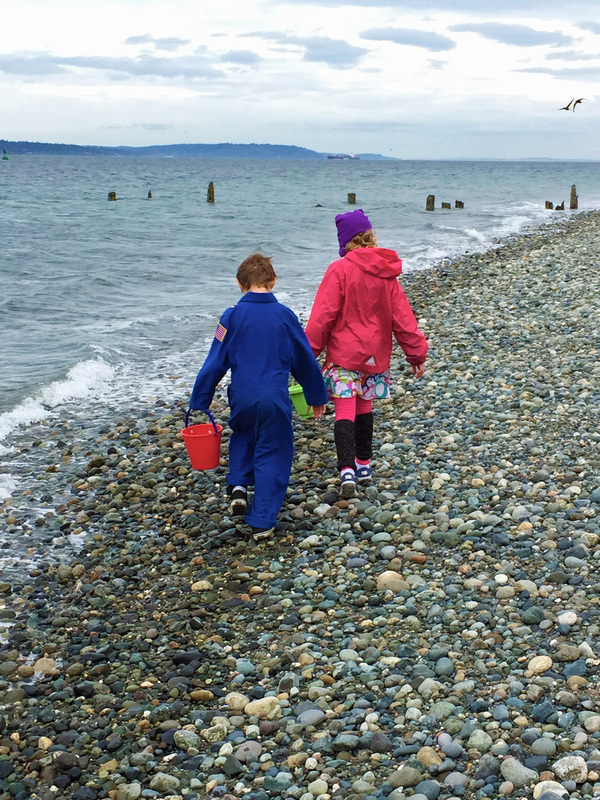 Next we wanted to do some hiking and check out a beach so we headed to Carkeek Park. The descent down to the park was a bit steep and winding which made for a thrilling ride, but I couldn’t help but wonder if this would be the only way out. Curse the Google Map app for iPhones, it still doesn’t provide the change in elevation! Well, too late, might as well enjoy ourselves now and face the consequences later. We parked our bikes at the information center and hikes down to the beach. 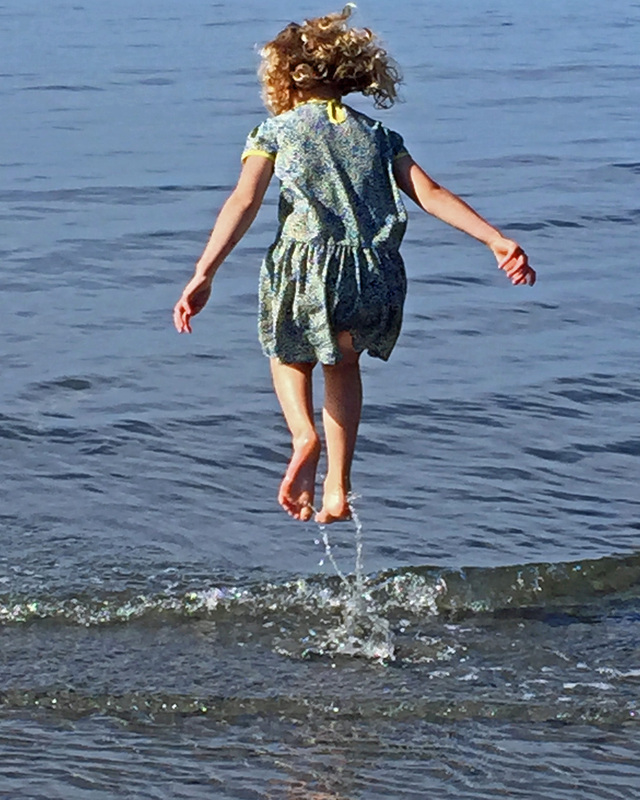 The weather was warm and sunny and the kids stripped off every article of clothing we would allow them to and ran for the water. On our way back to the bikes we saw a sign indicating that they were feeding the salmon fry. We wandered up the path and found the park ranger. 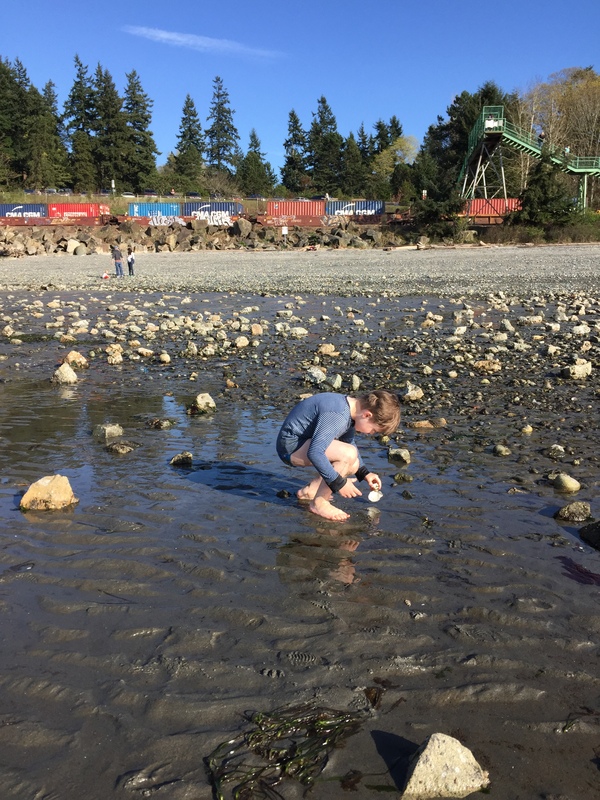 He was packing up, but kindly walked my children back up the path and let them feed the salmon fry. 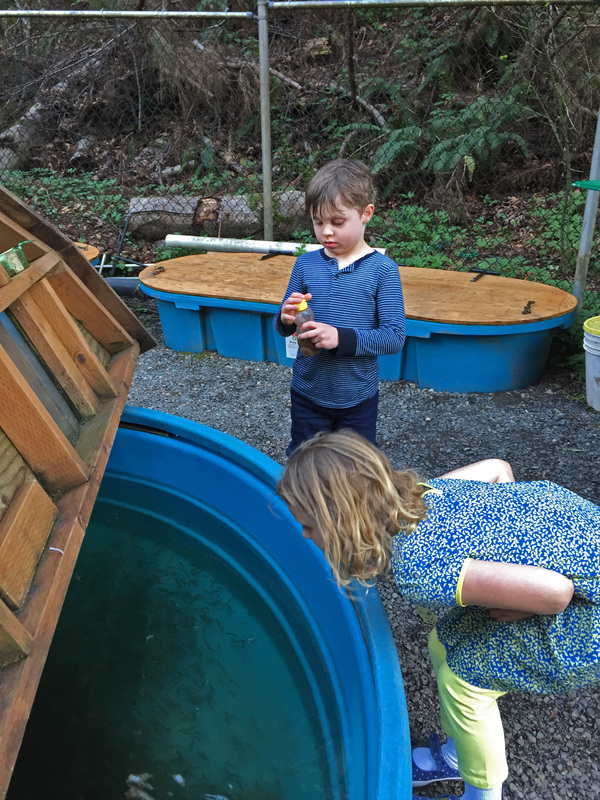 He talked with them at length about salmon eggs and how salmon migrate and return to spawn. They were eating it up. Then we hurried back to our bikes to conquer that steep and winding climb up Carkeek Park Rd, which has no bike lane, before dark. We had intended to stay in the Ballard Neighborhood so we could partake of some of the great restaurants, but as it turned out we were out exploring so much that we didn’t take in much of that scene. We did make it a point to head back to Ballard this night and enjoyed some Thai food at Pestle Rock. This wasn’t your typical Thai food, there were lot of fish and salad options. I had the yum kao tod, a crispy curried rice dish which was seasoned with fresh Ginger, and other herbs. The lettuce that it came with it was a nice cool and crisp accompaniment to the dish’s intense flavor and spice. My son and husband raved about the Muu Pha Lo which was a pork that had been stewed in spices and herbs and was reportedly also very flavorful and succulent. 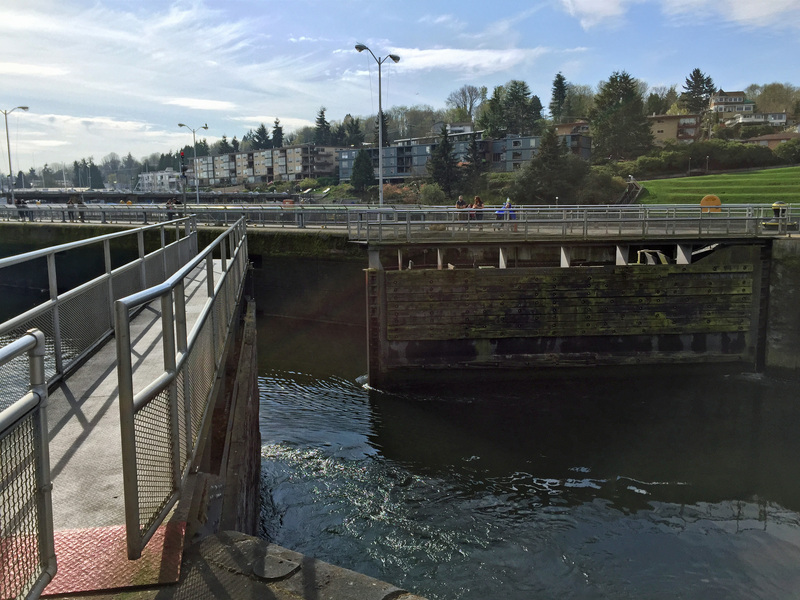 On day 3 we headed down to the Ballard Locks. We were delighted to come across friends from Portland arriving there at the same time. This being a Friday there were lots of boats coming through the locks. 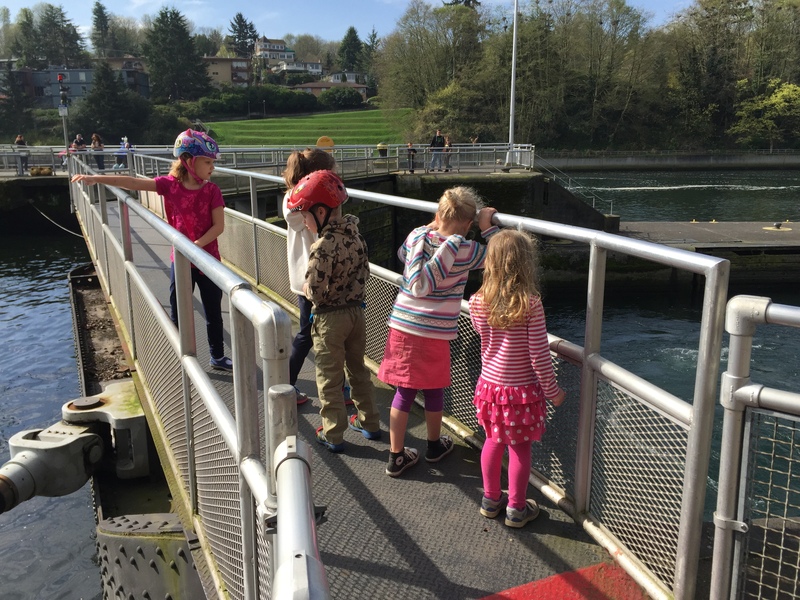 We were able to see boats come through both the small and large locks. In addition we were able to see the Fremont bridge raise up to let a sail boat through. The kids found all of this very interesting. The deck of the Big Dummy made a great platform for viewing the action. 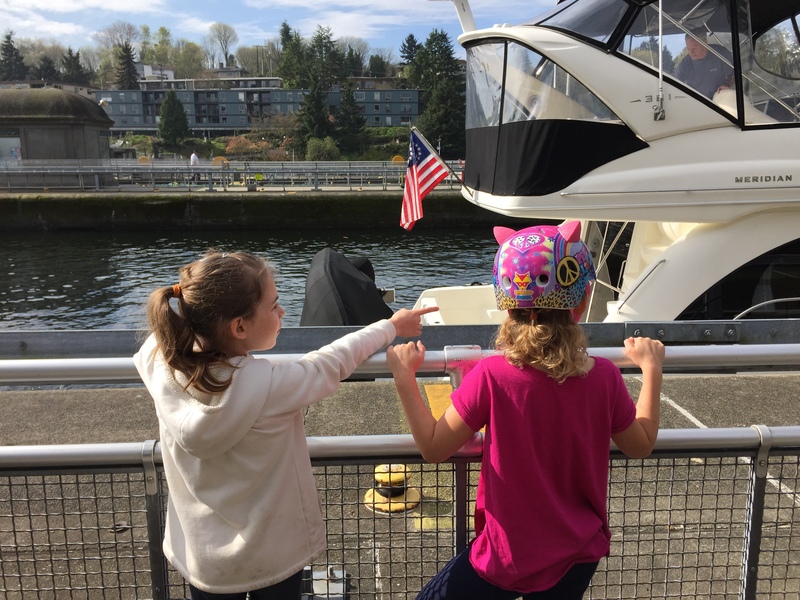 Madi met up with us as we were leaving the locks to ride take us for a ride on the Elliot Bay Trail down to the Seattle Aquarium. The Elliot Bay Trail was by far my favorite ride of the whole trip. In fact, if there is a lovelier urban biking trail, I haven’t experienced it. Early on the trail you are riding alongside train tracks. We got to see several Boeing airplanes being shipped by train, wings removed, which was pretty exciting for our little train enthusiast. 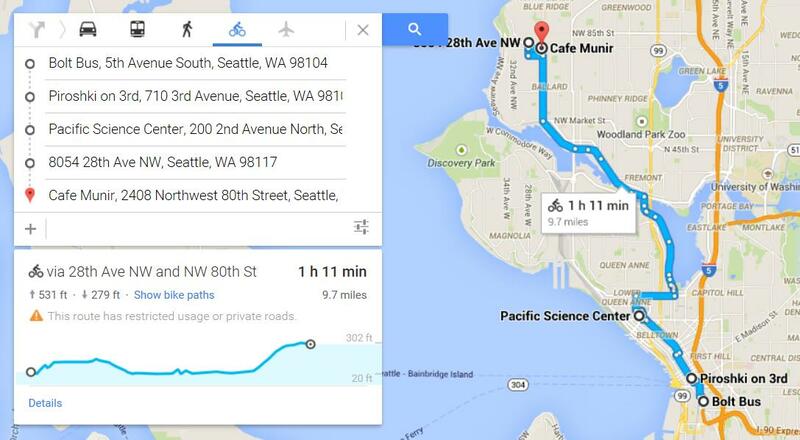 Then you reach a stretch that is very park like bordering the Puget Sound. 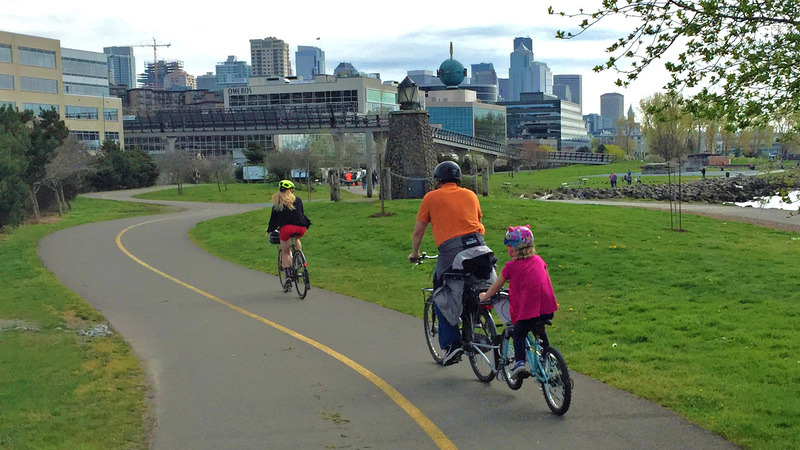 As you are biking along the city scape becomes visible on the horizon. Unlike the Portland water front, pedestrians and bikes have separate spaces making it less chaotic. There was also considerably less traffic making it considerably more enjoyable. 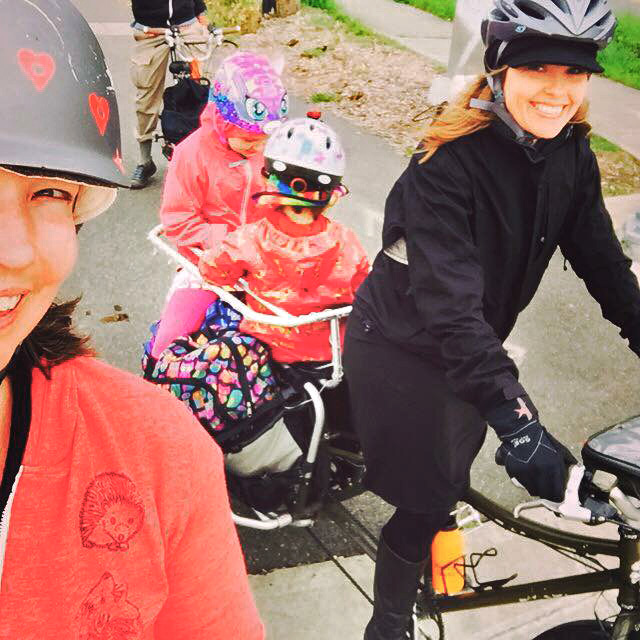 We even felt safe giving our littlest rider, who just learned to pedal a few months ago, an opportunity to experience some independent riding. The aquarium was as good as any we have visited, however, the “parking squid” turned out to be the real attraction for my kids. 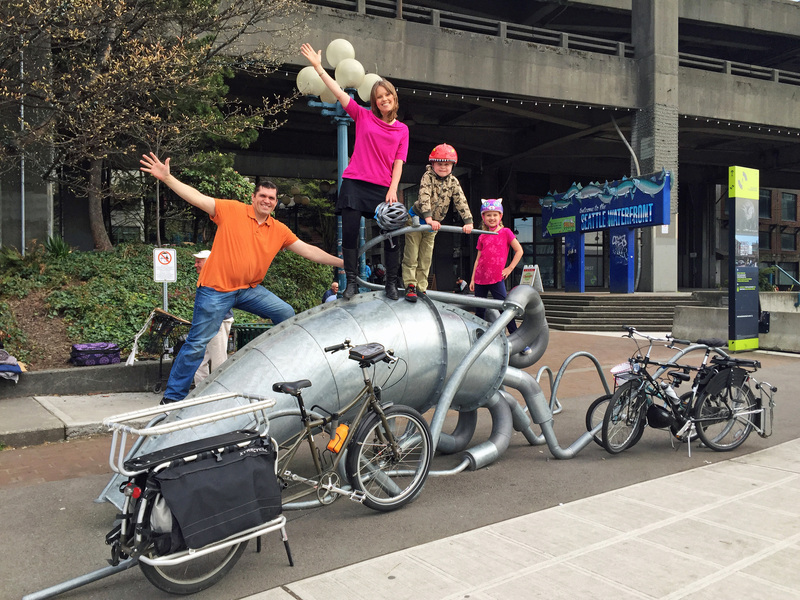 Madi explained to us that the squid was not only a piece of art—It was also intended to be used as a bike rack. Unlike many artistic bike racks this one was actually quite well suited for the purpose. And, it was a wonderful climbing structure which kept my kids engaged for almost an hour. On the way home we stopped at Red Mill Totem House. 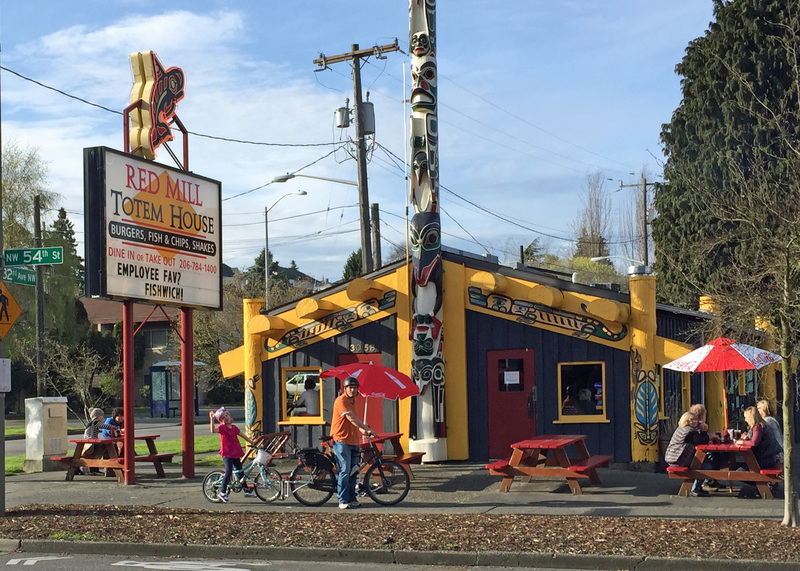 This is one of two Red Mill Burger joints in Seattle. 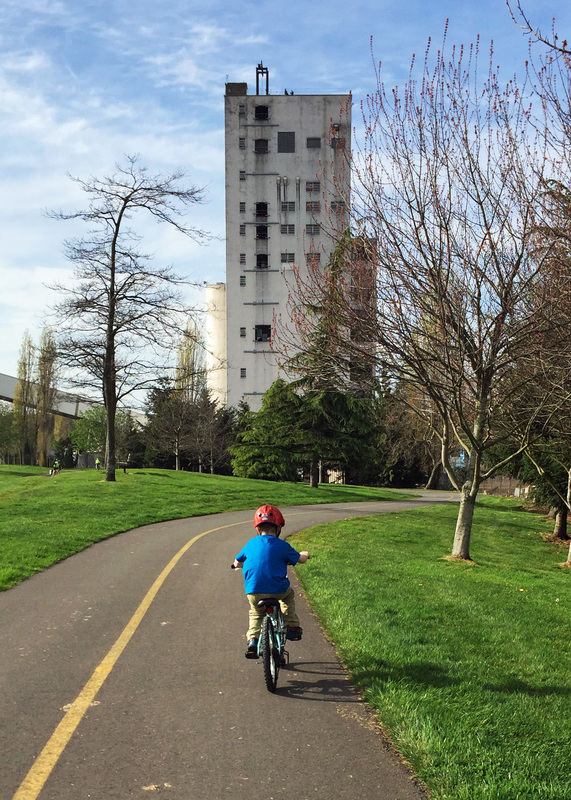 This place got rave reviews from folks in the Seattle Family Biking group. We were told by others that Oprah rated their burgers among the 20 best burgers you must try before you die. With endorsements like that we had to check it out. 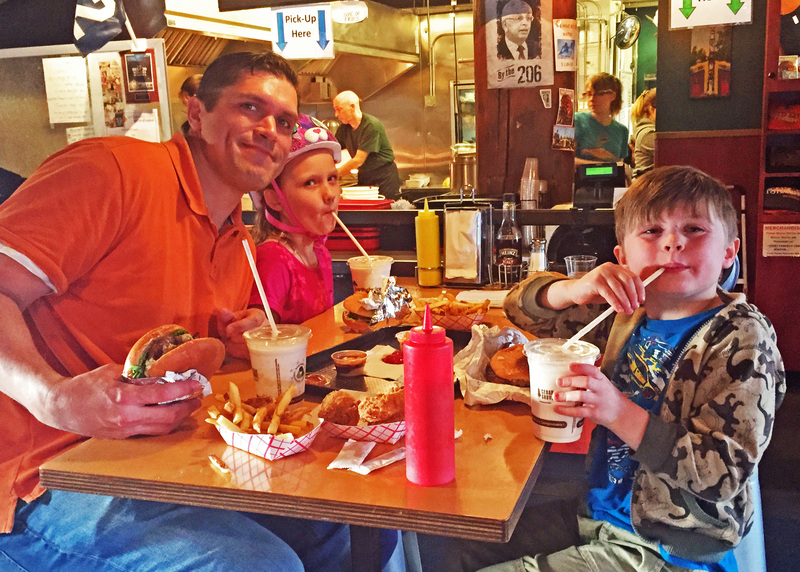 We indulged in burgers (veggie for some of us), fries, AND milkshakes. It was everything you fantasize that burger joint food should taste like. We left to face our mile long climb very full and satisfied. 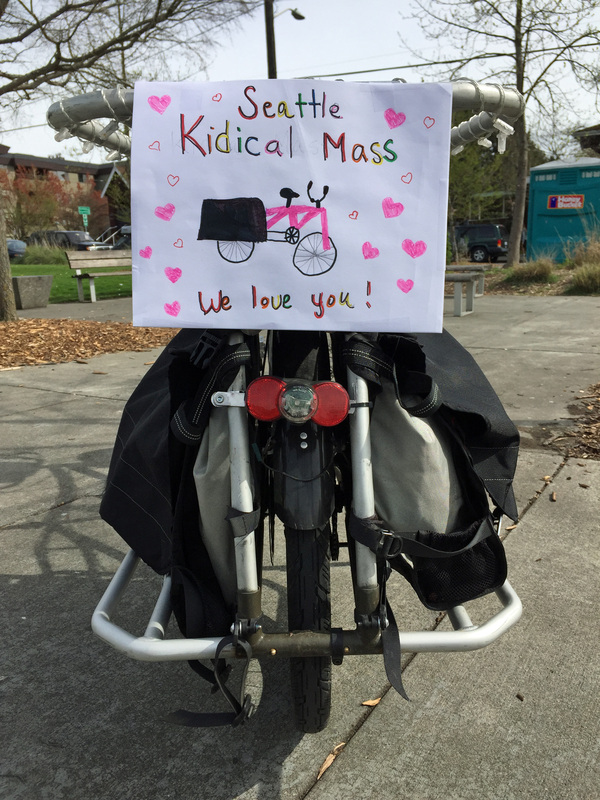 The Kidical Mass ride was the highlight of the trip for my kids. 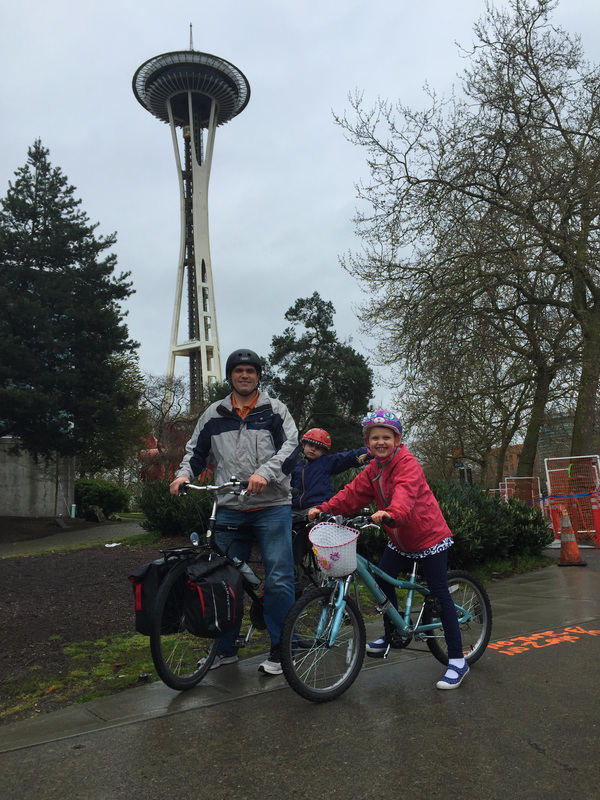 They were so excited to meet all the Seattle biking family kids. 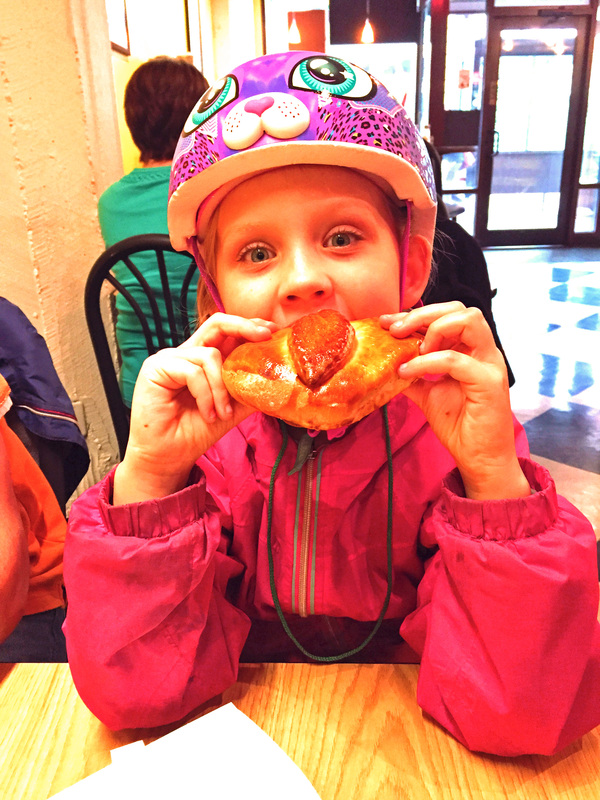 My daughter felt pretty special that her request for pastries had inspired the “Dessert-filled Kidical Mass” ride. 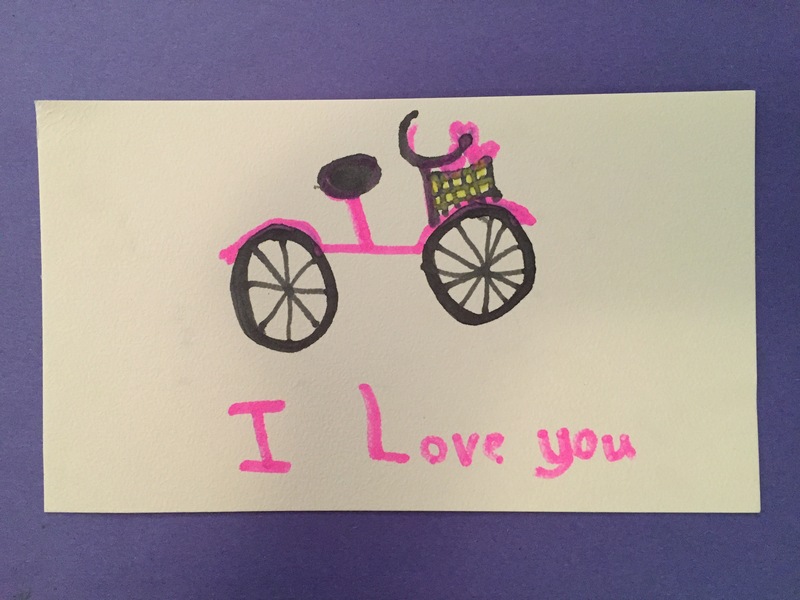 To illustrate her gratitude, she drew a picture featuring Madi’s “Momma Bike” for the back of our bike. It was great weather for the ride and we had a nice turn out. The ride began at the Ballard Library so we arrived early and read books for about an hour. Then we headed across the street to play at the Ballard Commons Park where the kids enjoyed watching the skateboarders preform tricks in the skate bowl. After going through the rules, Madi started the ride. 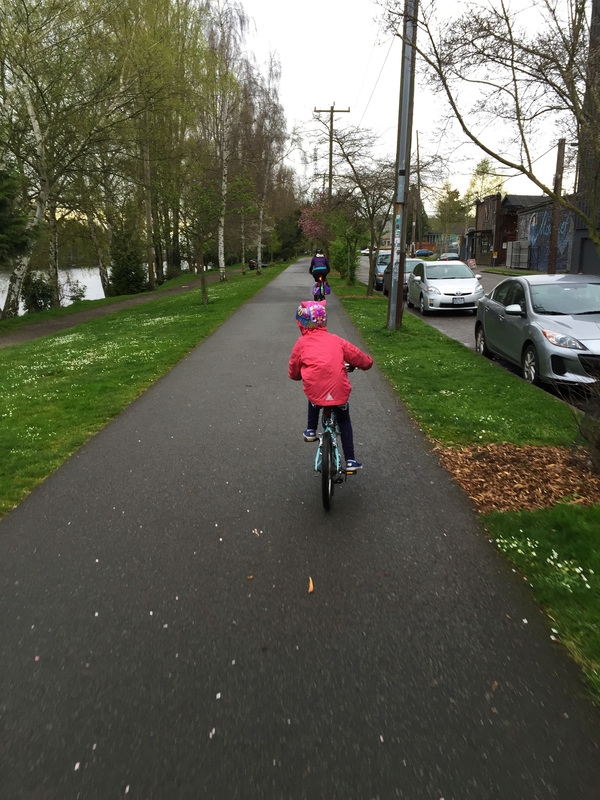 We headed down the Ballard Greenway. There was a pack of young riders, including my daughter and Madi’s boys that tried to take the lead, but Madi was able to reign them in, wow, props to her, she’s got skills! 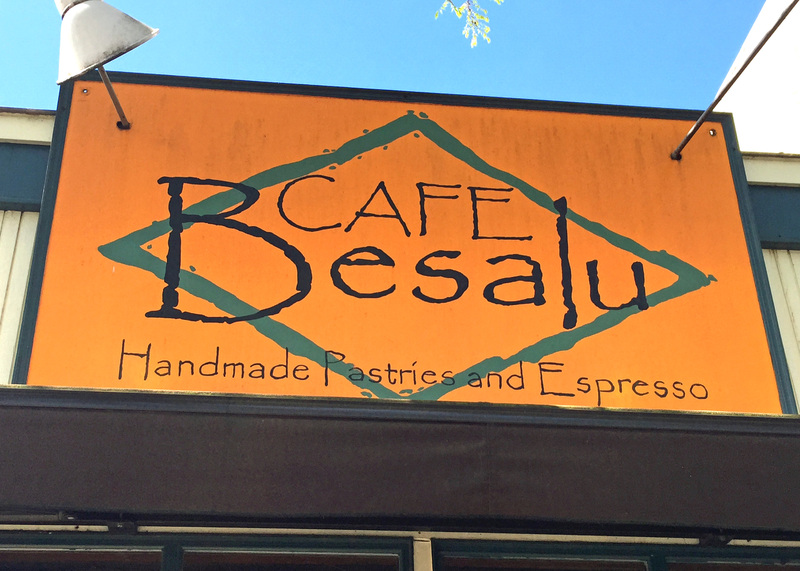 Our pastry destination was Café Besalu. 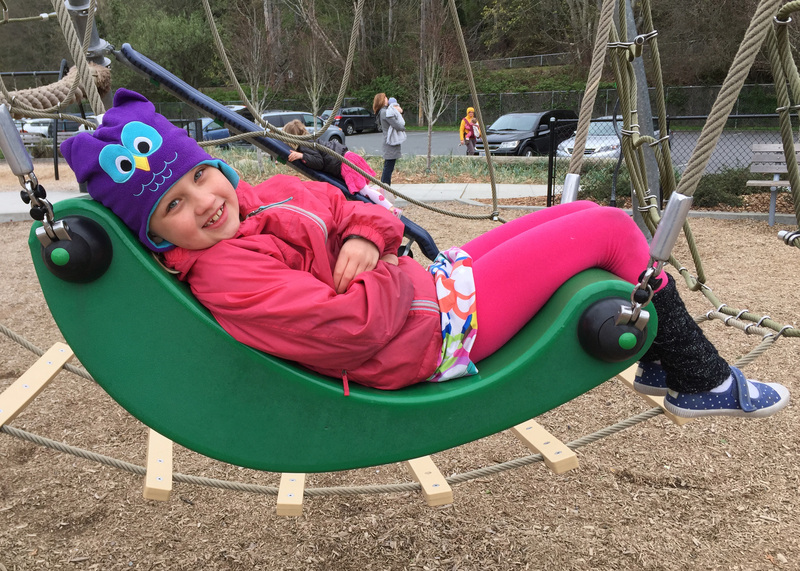 After eating way too many pastries we headed to headed to Adams Elementary School playground were most families hung out while the kids played for another hour or more. 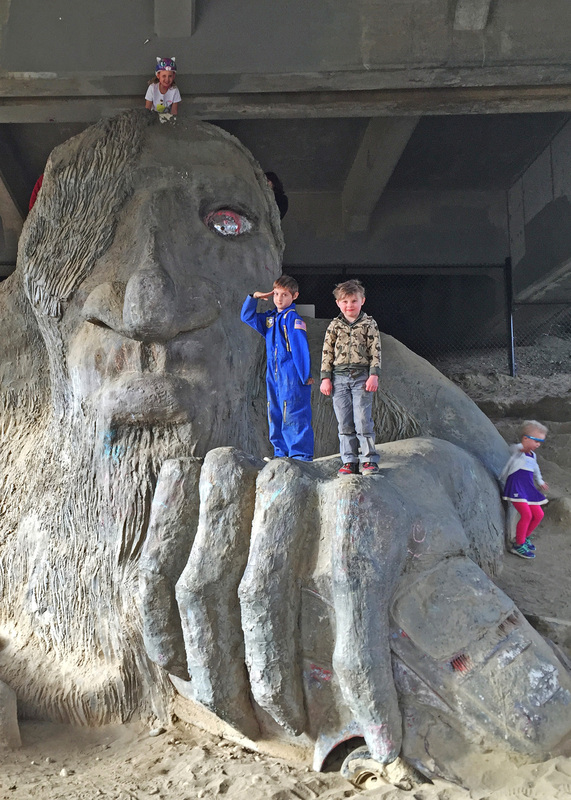 We wanted to fit in one last destination and we decided on the Fremont Troll. Madi offered to lead us there, which I was very grateful for because upon seeing the approach, I think it would have been very tricky to get there with nothing but Google Maps as a guide. My son was feeling a little left out as all the other kids had their own bikes. 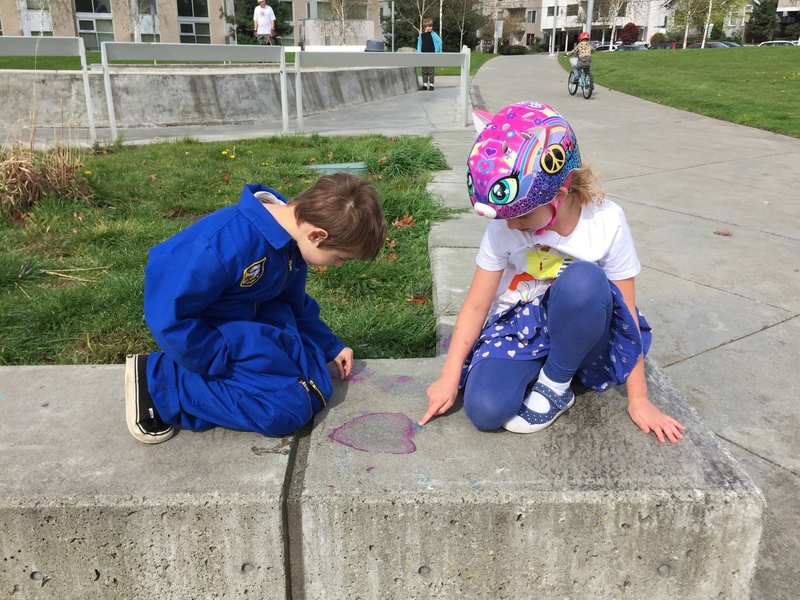 We had strategically decided to leave one child bike at home so that the kids could trade off when they got fatigued—a plan that had worked brilliantly until that moment. Madi saved the day by letting him ride on the Momma Bike. I did feel a little guilty when Madi had to climb the steep hill to the troll with him on back while I was luxuriously child free, THANKS MADI!!! As soon as they set eyes on the troll they ran for it and began climbing. Before I knew it my daughter was on top of his head. When they digressed to rock throwing my husband directed them all back to the bikes. We were all starving by that point, and Madi offered that there was a conveyor belt sushi place nearby—we were in. Conveyor belt sushi is a brilliant option for dining with children for a variety of reasons: the entertainment of the sushi coming around on the track; the opportunity for the kids to make their own choices; and the instantaneousness of getting the food in front of them. It was about as stress free and enjoyable as any dining out experience with four kids could be. 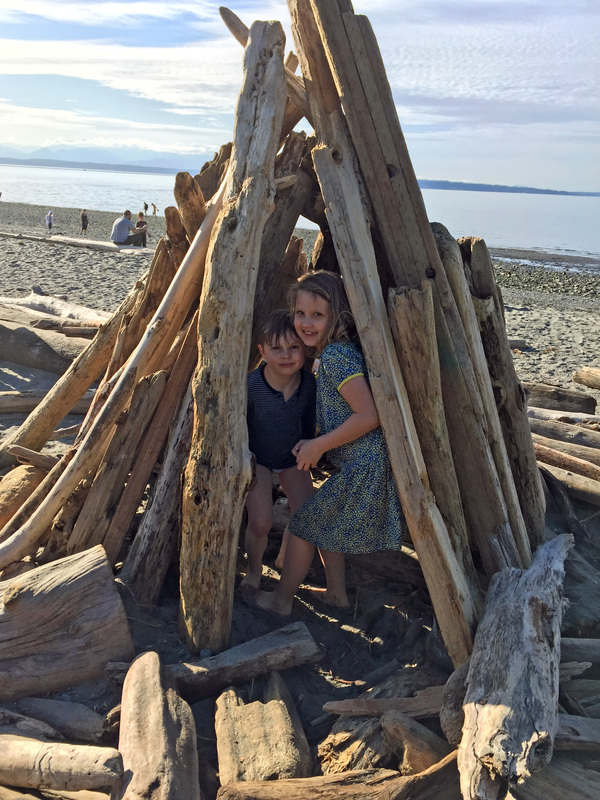 Our final day was spent hanging out with Madi and Sara and their families at Golden Gardens Park. Golden Gardens Drive was another fast, windy and joyful decent, especially since we knew we didn’t have to climb back up it. The park had a great playground with a large climbing structure. 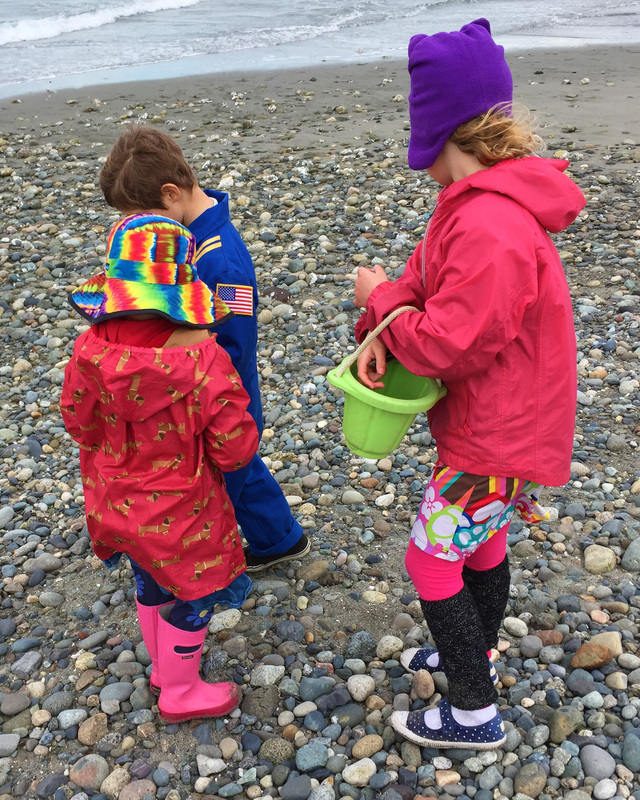 The kids also enjoyed combing the beach for shells and beach glass. 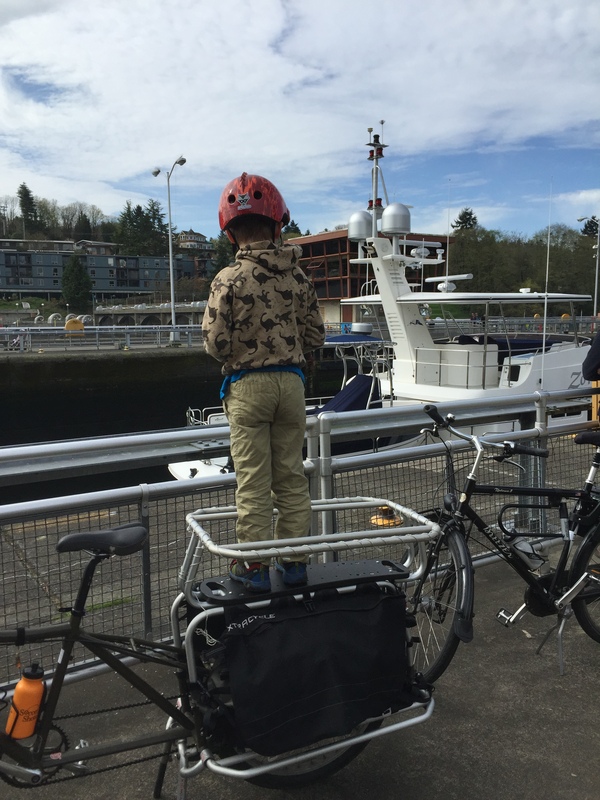 When it was time for us to head toward downtown to catch the Bolt bus the whole crew decided to ride with us along the Burke Gilman Trail back to the Ballard Locks. This was another lovely stretch of trail, almost totally flat. 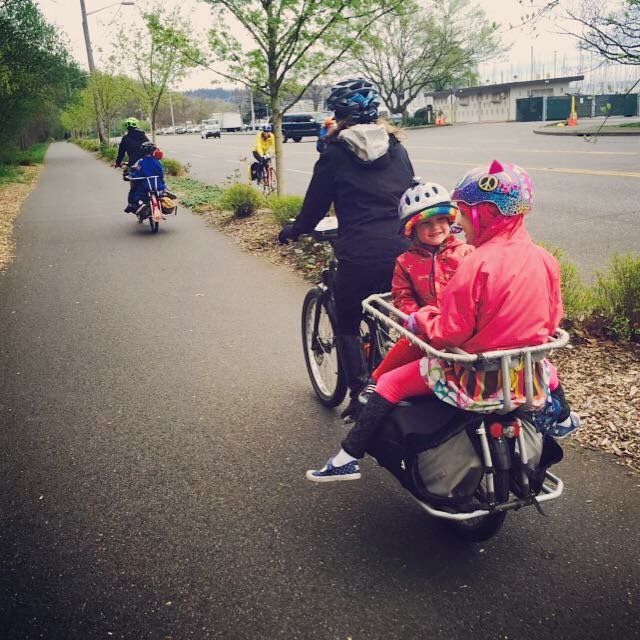 One of my favorite parts of riding with other families is the mixing of kids and bikes. I got Sara’s daughter and Madi squeezed Bryant between her boys. Hearing the whimsical role play conversations that happened on the back of my bike between this pair was delightful. We stopped at the locks so say a quick good bye. I was worried that we were cutting it a bit close. Our previous driver had recommended that we arrive 30 minutes early so we could be sure to catch the return driver before he/she started loading and let him/her know we had bikes. Unfortunately, we screeched in exactly 15 minutes before departure and the bus was mostly loaded. Luckily, they hadn’t even opened one of the bays and we are able to get our bikes no problem. 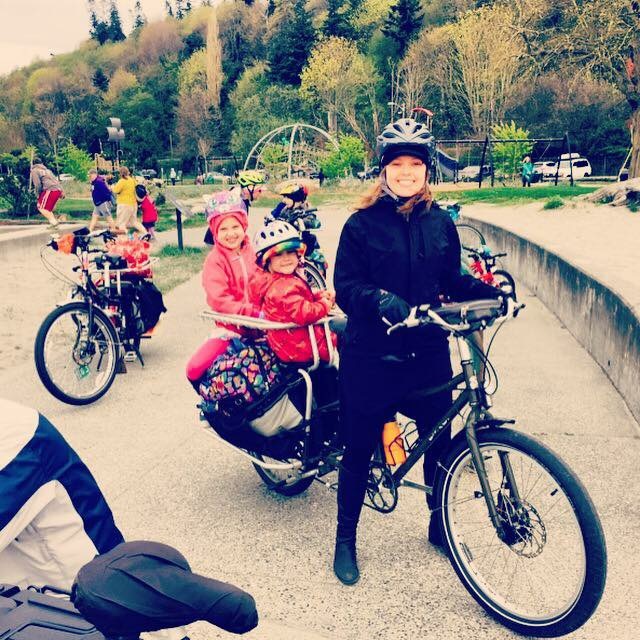 Thank You Seattle Family Biking Community! What an amazing trip! 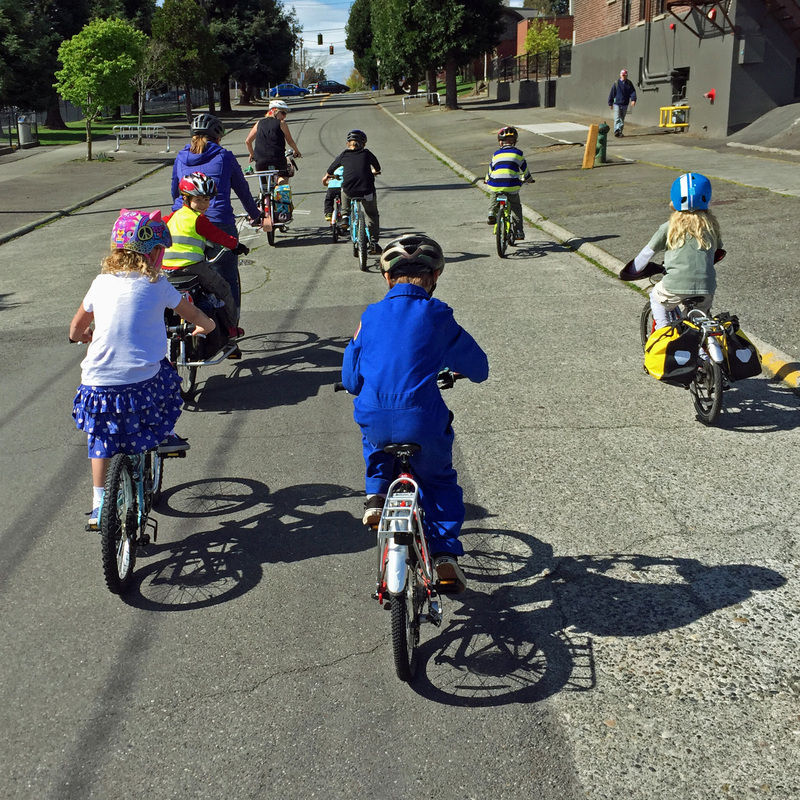 Thanks to everyone from the Seattle Family Biking group who made recommendations and joined us for the Dessert Filled Kidical Mass Ride. 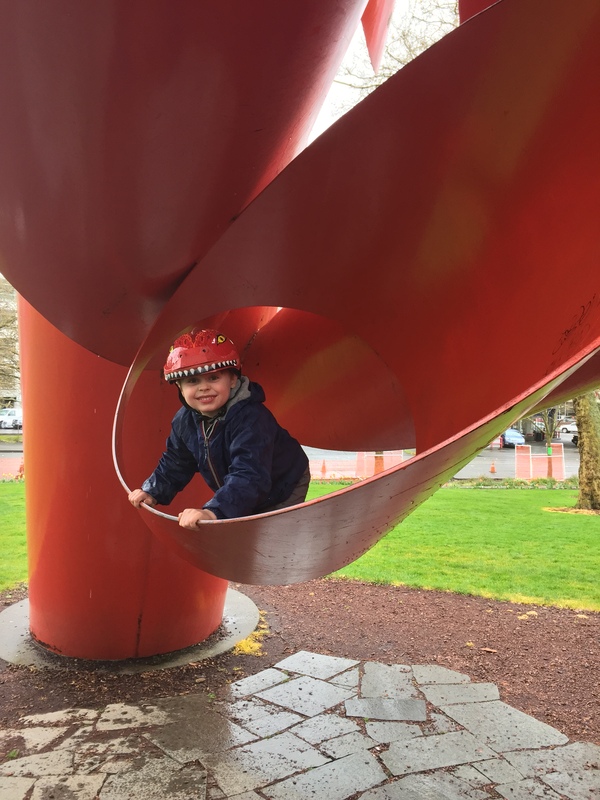 We didn’t get to experience all of the recommendations—something to look forward to for our next bikey Seattle adventure. The kids are already begging to go back. 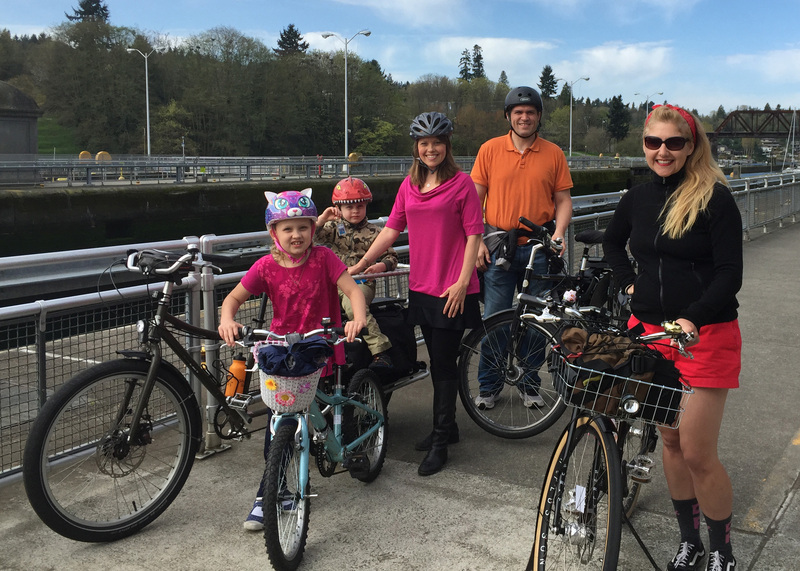 Huge thanks to Madi who is the best family biking ambassador that any city could have, and to Sara who shared her family with us. Our trip wouldn’t have been half as fun without you all riding with us! Hope I can pay it forward and ride with some of you in Portland sometime. 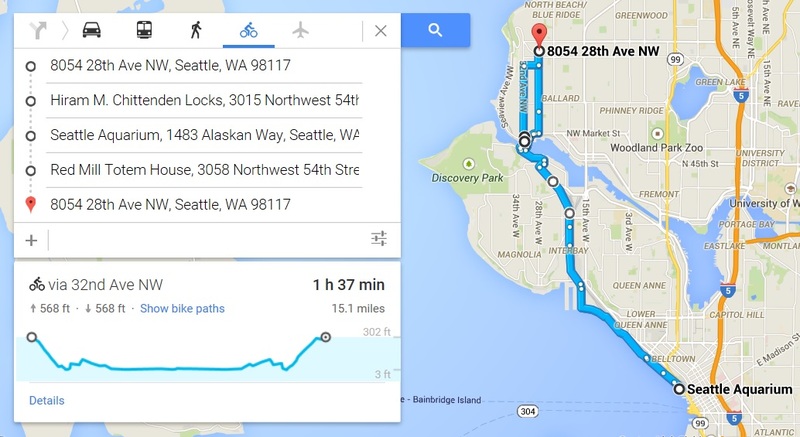 Do you have a recommendation for another city that is fun to explore by bike? I would love to hear your suggestions below.